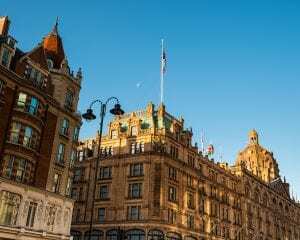 Knightsbridge is home to many luxury, designer shops, including the department stores Harrods and Harvey Nichols, and flagship stores of many British and world-renowned fashion houses such as London-based shoe designers Jimmy Choo, Manolo Blahnik and Prada. With this calibre of retail and high fashion available, it’s little wonder that Knightsbridge is renowned as one of the world’s premiere shopping destinations. There’s more to Knightsbridge than just shopping. The area has many dining options including Michelin Star restaurants, one of London’s most famous Royal Parks – Hyde Park, and is just a short distance to some of the world’s finest museums. So if you are travelling with someone who might not appreciate a day of high-end shopping, there is plenty to keep them occupied on a day out in Knightsbridge. Speakers’ Corner is an area of historical significance located on the north-east edge of Hyde Park, just a few minutes’ walk through the park from Knightsbridge. This site is well known to have been used by the likes of Karl Marx, Vladimir Lenin, and George Orwell to address the masses. Speakers’ corner is still used today as a place where people can passionately demonstrate their right of free speech and is well worth a visit while you’re in the area. Walk a couple of minutes outside the hotel to Gunnersbury Station and get on the District line towards Upminster. Get off at Hammersmith Station and change to the Piccadilly line towards Cockfosters and get off at Knightsbridge Station. The beautiful royal palace, situated in the London Borough of Richmond Upon Thames, is only 30 minutes’ drive from Clayton Hotel Chiswick.